Ever found yourself with this baking dilemma? Fruit in your refrigerator or on your counter that you just HAVE to eat or it will go bad, wasting valuable and luscious food for which you paid good money? I was up against this use-it-or-pitch-it situation a few weeks ago with blackberries AND bananas. To be honest, I get TIRED and WEARY of banana bread, banana muffins, banana cake, blah, blah, blah...And, to add beautiful deep purpley-black, plump and juicy blackberries to this baking dilemma was, well, daunting...See my dilemma? 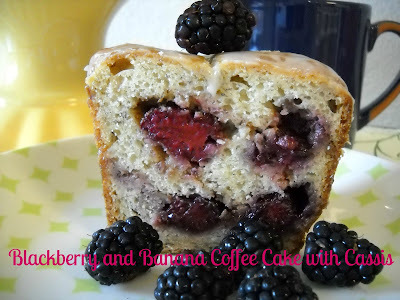 I found this recipe at Betty Crocker and it sounded and looked wonderful. I modified the recipe a lot bit by eliminating HALF of the butter (am I insane CRAZY?!!) and adding bananas instead. It turned at wonderful, moist and full of flavor. Not your typical and boring banana this or that, NO WAY! And, I also think it showcases the blackberries beautifully, don't you think so, too? It's a layered coffee cake, which I think makes it extra special fancy and one with real WOW Factor. And, it really is EASY...WOW and EASY!! Best to grab a fork NOW!! Make your blackberry filling...Let this sit a while as you want these flavors to form a good and happy marriage. The Cassis adds so much fragrance and depth to this mixture. Beat the sugar and butter for 2-3 minutes. Add the vanilla and eggs, one at a time and scrape the bowl between each egg. Mix in the mashed bananas. With the mixer on low, gradually add the flour mixture alternating with sour cream, beginning and ending with the flour mixture. Spread one-third of the batter into the prepared pan and sprinkle with half of the blackberry filling. Spread another one-third of the batter carefully over the filling and sprinkle with remaining filling. Spread the rest of the batter evenly over filling. Bake as directed and let cake cool for a solid 20 minutes. You want it to set before trying to remove it from the pan. It's actually quite delicate. She's a BEAUT! Cool it right side up so that when you glaze it, you glaze the TOP of the cake. Glaze when the cake is completely cooled. Drizzle the glaze so that it runs down the sides. You want the homey look, but the fabulous and "wow" factor look! :) See? 1. Preheat oven to 350°F. Grease bottom and side of 10-inch tube cake pan with shortening and lightly flour. 2. In a small bowl, mix all the blackberry filling ingredients and set aside. 3. In a medium bowl, mix the flour, baking powder and baking soda and set aside. 4. In a stand mixer, beat the sugar and butter for 2-3 minutes. Add the vanilla and eggs, one at a time and scrape bowl between each egg. Mix in the mashed bananas. 5. With the mixer on low, gradually add the flour mixture alternating with sour cream, beginning and ending with the flour mixture. 6. Spread one-third of the batter into the prepared pan and sprinkle with half of the blackberry filling. Spread another one-third of the batter carefully over the filling and sprinkle with remaining filling. Spread the rest of the batter evenly over filling. 7. Bake for cake 50 to 60 minutes or until a toothpick poked in the center comes out clean. Cool for 20 minutes. Gently loosen the sides and remove from the pan to a cooling rack. Cool right side up for at least 1 hour 30 minutes. 8. When the cake is completely cooled, make the glaze. In small bowl, stir all the glaze ingredients until smooth and thin enough to drizzle. Drizzle the glaze over the cooled coffee cake, allowing it to run down the sides. Enjoy! See, I told you to go grab a fork! Can you see the cinnamon and pecans all mushed with the luscious blackberries? I highly recommend a nice cup of coffee (or tea) as the perfect paring. Super duper moist...Not crumbly at all! Today started with 1/2 a cupcake...How bad can the day be when it ~starts~ with a cupcake? :) Lv! I think you'll like this one, Mel. Not too sweet and the blackberries with that little hint on Cassis-YUMMO! This was delicious. I really wanted seconds, but took another home for my husband and only had one bite of it. Going to make this today for a dinner with the neighbors. Thanks, Martha! Means a lot to me as you are a master baker. :) Glad Gus enjoyed it as well. Let me know how it turns out! What would happen if I upped the Cassis to 4 Tb instead of 2? Could I compensate that addition by adding more pecans? Or will it be fine? It turned out really tasty, very dense and moist! The only thing I would probably change is making a Cassis-based glaze instead of a vanilla + sugar based one. It seems like the cassis flavor was baked out (as that usually happens to alcohol in high temps).